My latest wall hanging is a bit of a departure from the ones I usually make as it is wider than longer. But I really like how it turned out! 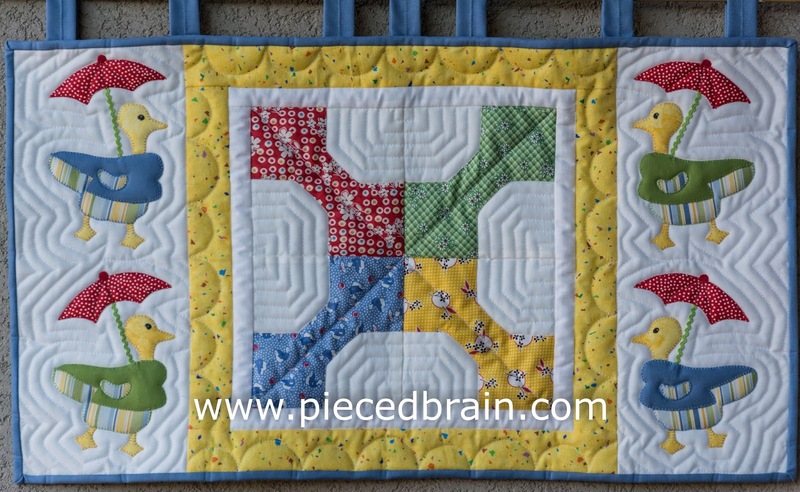 It measures 27-1/2" x 15-1/2", has a flannel backing, and the applique ducks were inspired by one of the prints I used on the center block. 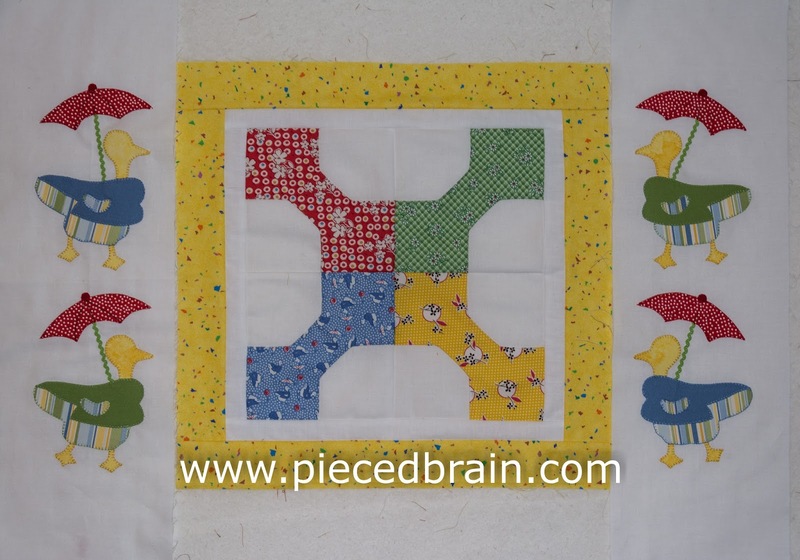 After joining the bow tie blocks I added a narrow white border, then a wider yellow border, still not knowing how it would look like in the end. That is when the idea of the ducks came along. I dug deep (I mean, really deep) into my stash and found fabrics that would go along well (as the center blocks were made in a class I took almost 3 years ago, so the fabrics weren't even mine!). 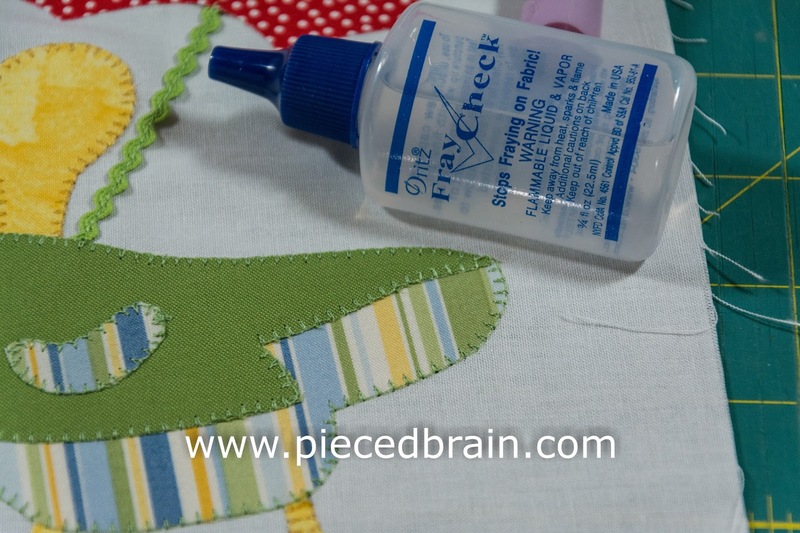 I machine appliqued everything using my favorite stitch, the blanket stitch. I used Fray Check only at points where the thread did not quite get knotted. However, for quilts that will be washed often I apply it all around the applique pieces. Here is how I determine where to place the hanging loops: after I sew the binding to the front of the quilt, I measure (on the front of the project) and place pins where I want the loops to be. I flip the binding and use binding clips to secure it. Then, I fold the loops in half and insert them between the binding and the backing, making sure the center of each loop is aligned (sometimes not perfectly as you can see for the loop on the left!) with each pin. 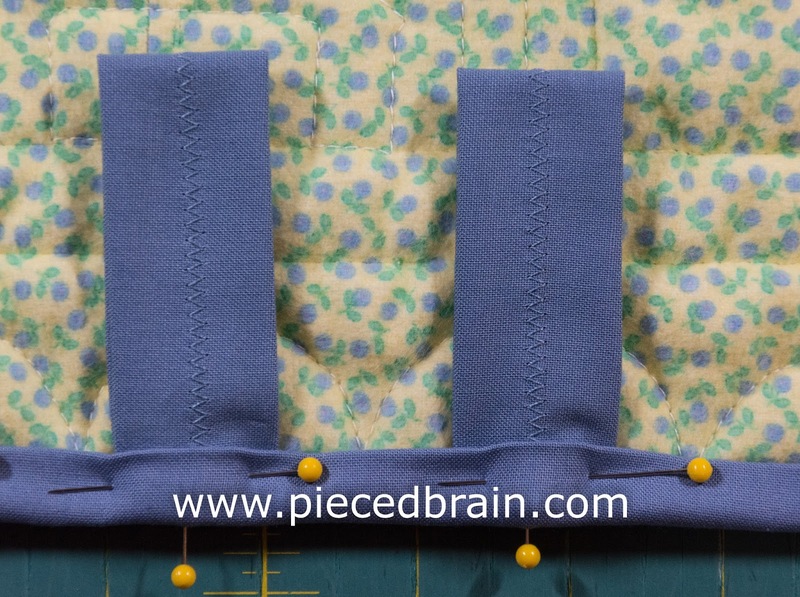 Then, I hand sew the binding in place (through the loops). 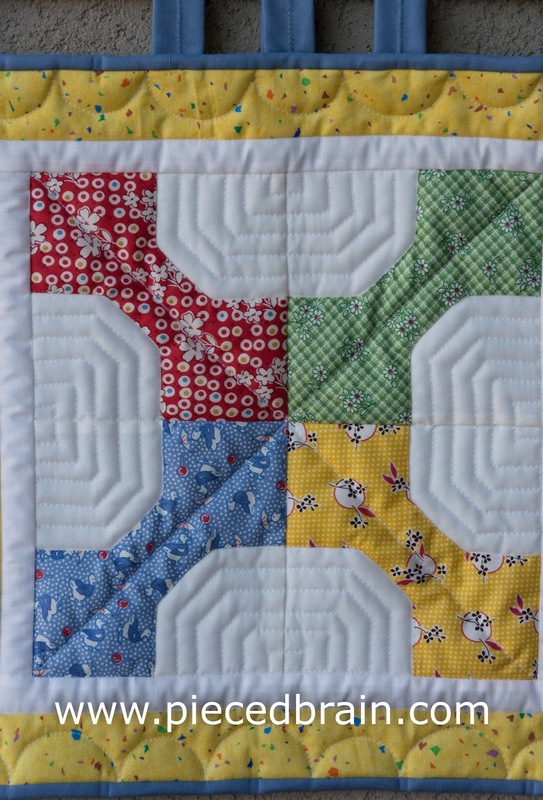 The quilting is very simple, with large and medium size scallops on the yellow border, and echo quilting everywhere else. Also, I stitched in the ditch on every straight seam and FMQed using monofilament around the appliqued pieces. The batting is high loft polyester, which adds high relief to the quilting, reminding me of baby quilts of decades ago. I painted the eyes on the ducks (will add a drop of white paint later to each of them), and voila'! The colors are very cheerful and will grab a baby's attention right away. This is my finish for today. Block #3 for the City Girl Sew Along will be posted this coming Thursday. Don't forget to stop by then! 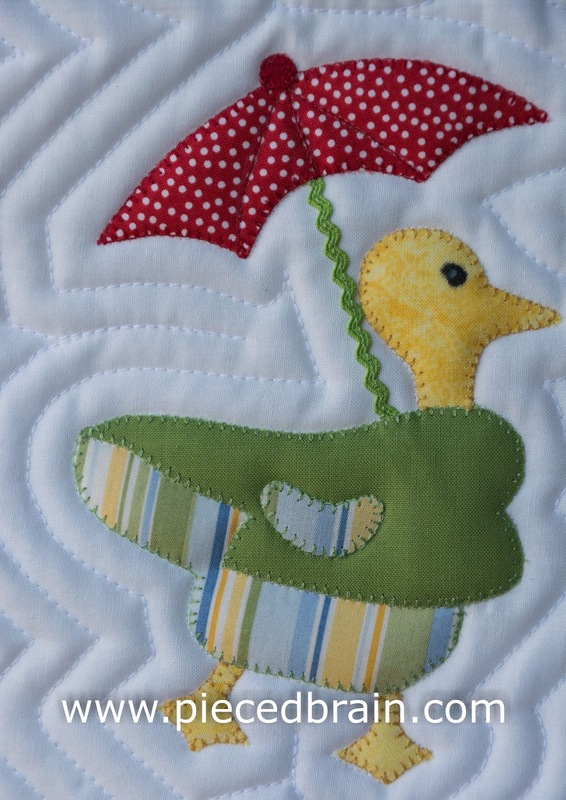 Oh those applique ducks are adorable! Thank you! I had fun choosing the fabrics and working on them.